With Isaac having taken his time to depart our region, then returning as a remnant of heavy rains followed by another Isaac leftover threatening to become Isaac Jr., I have been so aggravated with recent wind, rain, heat and humidity that I have fallen into grumbling about other things, too. Last night and today I have been reminding myself of some recent things I have enjoyed. I’ve got to do something before I turn into a scary harpy. Happy #1. Daughter-in-law Katie’s blog The Daily Skup. 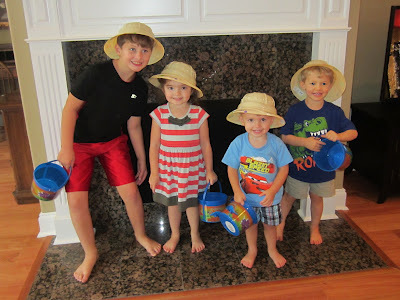 Katie’s chronicle of the lives of our Louisiana grandchildren has been delighting me with photos and stories of what they are doing and how they are maturing. Her posts are slices of daily life that have brightened some gloomy days. The photo above was a “dinosaur” birthday party. Grandchildren Molly Kate and Walker, center, celebrated with cousins from Katie’s family, Beau, left, and birthday boy Braedon, right. Katie had posted the image as a header photo some while back with no explanation of the event that had the four donning pith helmets. Katie is organized, consistent and thorough about documenting childhood events on her blog. I was confident that text and even more photos would eventually appear. I was not disappointed. While I waited I enjoyed her accounts of haircuts, traffic jams, dentist visits, a “real” tea party, first day of preschool and more. Katie is a prolific blogger. Happy #2. Long-distance conversations. Son Walt and daughter-in-law Sarah have supplied welcomed reports along with some funny stories about our four Georgia grands. A plus is that the reports also come with a glimpse of what son and daughter-in-law are up to lately. Thank you, Walt and Sarah. Push that left elbow straight! Happy #3. Movement. Getting back to walking with friends and resuming therapy. Since my stroke, when I am able to increase my mastery of some basic daily living chore at home it makes me feel great. But walking with friends and engaging in challenging and exhausting therapy sessions provide a special sense of satisfaction and exhilaration that keeps me positive and working to push past my current limitations. Thank you, friends Ann and Pat and Ocean Springs Nero Rehab therapists and techs. Happy #4. 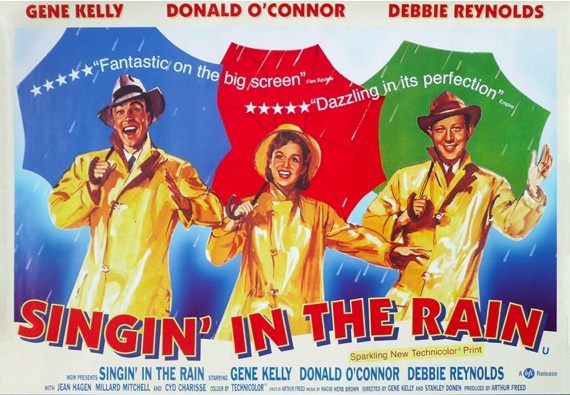 Hubby Walter surprised me with tickets to a one-night special showing of the musical Singing in the Rain, released in 1952 and starring Gene Kelly, Debbie Reynolds and Donald O’Connor. I was only five in 1952 and my parents rarely went to movies, although I do remember seeing Rudolph the Red-Nosed Reindeer, Snow White, Cinderella and Bambi in theaters. But I had only seen Singing in the Rain on TV, never before on a big screen. The Turner Classic Movies (TCM) showing in theaters across the U.S. was a celebration of the 60th anniversary of the movie’s release. We saw it at a theater in a nearby city in August. TCM produced an intro that preceded the movie. It featured interviews that TCM host Robert Osborne had conducted with Reynolds and others that gave an inside view of how memorable scenes came to life and how working relationships evolved among Kelly, O’Connor and the newcomer Debbie Reynolds. Hubby’s surprise keeps giving me pleasure as I think about that simple evening out. Thank you Hubby and Turner Classic Movies. Happy #5. Hubby’s diet. Husband Walter is determined to lose down to his “cruising”* weight and has accordingly started counting calories. That is good news for me. I want him to be as healthy as possible. But when he gets serious about diet, it also means more salads on our menu, slimmed-down portions, low-fat menu choices and fewer meals out, all practices that help me keep salt consumption under control. I especially love salads and dress mine with vinegar and a tiny bit of extra virgin olive oil. Green onions, black pepper and red pepper substitute for salt. 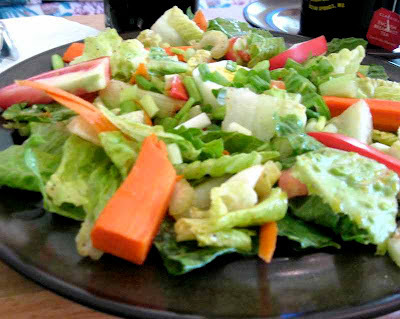 My no-salt salads are a happy choice and help keep my daily sodium consumption within the 1,500 mg limit. *Since cruises are synonymous with overeating for both of us, our cruising weight is what we need to weigh so that when we return home, we will weigh in without breaking our scales. We learned from past cruises that we gain at least five to eight pounds. We are going on a trip to the West Coast rather than a cruise next month, but we realistically expect “vacation eating” to occur. I know. We are pitiful. Happy #6. Cooler temperatures. Mornings were in the 60-degree range yesterday and today. Here’s hoping lower humidity and cool will stick around for awhile. i have been complaining a lot about our heat, i just came in and it is so hot we could fry eggs on the deck, in the shade is 94 but feels like 104. glad you found a lot of happy things. i am also afraid i might turn into my grumpy growling harpy friend. i say to bob, am I acting like B? if i am tell me because i don't want to be like that. Happy is good, stick with the happy and forget the pitiful. You're eating salad already, what's pitiful? Treating yourself is good too. If you eat a bit more when you're away, come back and eat salad again. You did find things to cheer you up!! Good for you. How nice for you to get away for a West Coast visit. I am going to California to visit my West Coast grands in three weeks. David is staying home with the "children" (dogs and parrots). This will be my first trip by myself since I had the stroke 8 years ago. I have been losing weight so the plane won't fall out of the sky. Ha ha. I fear all my excess weight came from travel for several decades. Now it must come off. I talked with my DIL and gave her a list of foods I can eat. I am determined to stick to the diet while I am in CA. Meeting a blog friend in WW and she will help me too. PS How nice your DIL keeps you informed with a lovely blog. I enjoyed this uplifting post :) It's so easy to get into a "funk" when we're trapped indoors for a while. I'm glad you've found some options to lift you out of it! It's wonderful that your DIL blogs regularly about the grandchildren, so you don't miss out on anything. Even though my "grands" live close, I still enjoy my DIL's regular postings on Facebook. I so enjoy your attitude and determination. When weather is blustery and overcast for more than a couple days, my happy countenance begins to sink. I'll have to remember to count my blessings in those days (fortunately few in this area). I love musicals, especially The Sound of Music, starring Julie Andrews! Enjoy being happy. It beats being miserable. I, too, love those musicals and agree that seeing them on the big screen in a theater is special. Salad looks good! Love the pics of your grands! Glad you're exercising and getting in shape for your trip. Sorry, you reportedly had difficulty leaving a comment on my blog. Feel free to just send your comment in an email at the address on the page and I can add it to the comment section if you like.